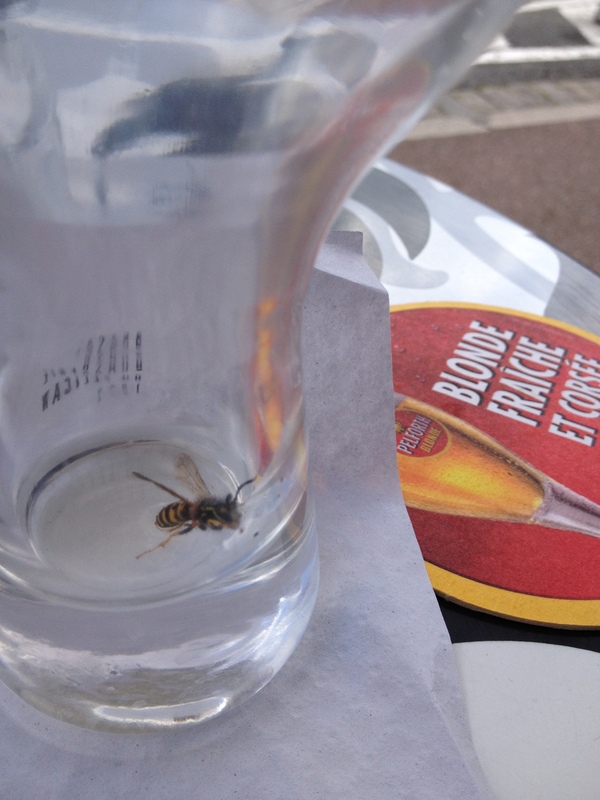 I’ve recently returned from Paris and one day as I was eating my jambon and fromage omelette with fries (that’s ham and cheese for you English speakers) and sipping a beer for medicinal purposes, this little bee decided to keep me company. If you’ve ever walked on cobblestone streets for days you’ll know what I mean when I say you need a beer for medicinal purposes. It numbs your poor ole feet pretty well. Keep that in mind if you travel to Europe. It works. 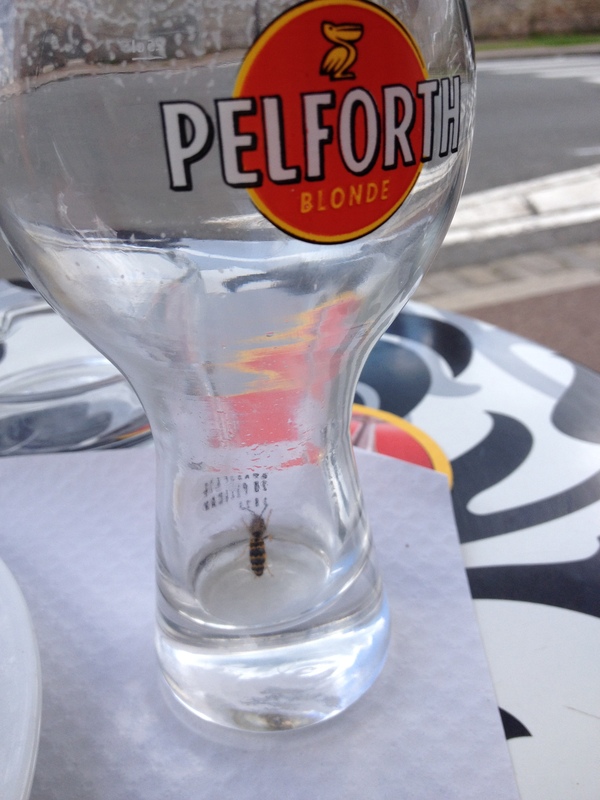 Anyway, this bee was really jonesing for some of my beer so when there was a smidge left, I let him in the glass. He had a grand time sucking up the suds. In fact, he couldn’t seem to stop and he needed some assistance in getting himself out of the glass. 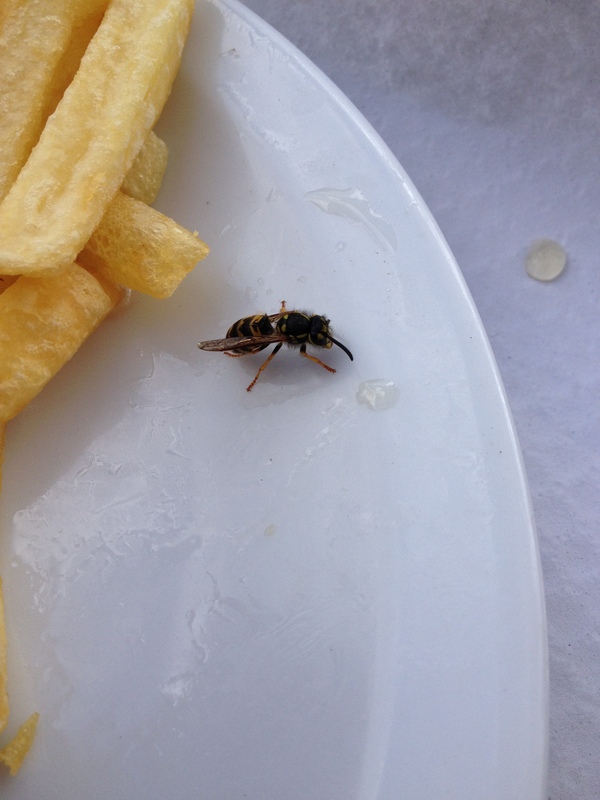 Of course, once he was out, he lolled around on my plate in a stupor. Do you think he was drinking for medicinal purposes, too? Were his little feet aching like my big ones? I think I found a soul- or is that sole- mate? Now that’s a happy bee. Of couse, coming from someone who’s got a thing about bees (and not a good thing), I’m in EWWWWWWWW mode while reading this. Lol. Looking forward to more stories about Paris! there is a “follow” button up at the top, Lavada. Oh my gosh, How did I miss it. Thanks, I’m following now. Cool. I donât post often over here. I have a release on Sept 20 so Iâll be more often over here for that.